The nature of Sino-American relations is rapidly changing. And that’s a good thing. Last week’s APEC meeting in Beijing shed new light on China’s relationship with America and the world. It has become increasing clear what China wants. China seeks a role in Asia comparable to the role that America has enjoyed with regard to Europe; as the unquestioned (but not always followed) leader of an alliance that seeks to protect their region from outside pressures and influences. As with the U.S. and Europe, China will continue to seek strong economic ties outside the alliance where those are helpful, but for security it wants clear leadership and support from other countries in Asia for China’s goals of greater economic and military power. China does not simply view the U.S. as a hegemon that it wants to supplant, but as a country whose days as global hegemon are over. 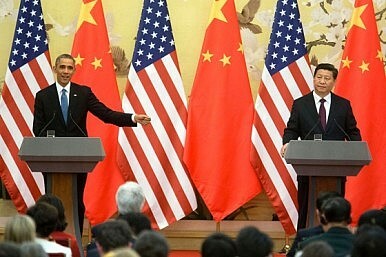 In Beijing’s view, Washington should make way for other, equal powers, to have leadership over some areas of the globe. In fact, I think China will find its relationship with other Asian countries more like America’s relationship with Latin America – that is, other Asian countries will view Chinese power with a mixture of admiration and suspicion, and will foster their own nationalism and resistance to China’s hegemony even while seeking advantages from allying with China on certain issues. Overall, China’s rise to greater regional power and America’s loss of global hegemon status are inevitable. America’s dominance was a result of victories in WWII and the Cold War that left other powers weak. But with China’s rise – now with over four times the population and an economy of equal size (in PPP terms) to the U.S. – it is inevitable that a more balanced arrangement of global power should arise. The only real question is whether that transition will lead to more cooperation between a China and U.S. who increasingly share responsibility for major global issues, or to conflict. There is a major risk that China and America become rivals, fighting proxy wars or even direct skirmishes over Chinese control of archipelagos in the western Pacific, and over Chinese conflicts with Japan, the Philippines, Vietnam, or other countries. Yet that seems to me the less likely outcome. In fact, China and America share so many interests – in a stable global economy, in free and open sea lanes for transit of raw materials and manufactures, in maintaining peace in the Asia-Pacific region, and in coping with global environmental threats – that cooperation for the most part is more likely. Last week’s agreement between China and the U.S. on goals to reduce carbon emissions is an excellent example of that cooperation. At the same, last week showed how differences could be handled. On human rights, one of the most contentious issues, Chinese President Xi Jinping claimed that China was making progress, although that progress was not yet complete; while President Obama had to make public declarations that the U.S. is not involved in fomenting unrest in Hong Kong. On the whole, last week’s meeting should reassure those who have been forecasting an inevitable war between a rising China and a declining U.S. The nature of the relationship will change, but that is good; the world is changing fast and the relationship between the U.S. and China needs to develop and mature to keep abreast of those changes. Judging from last week, that process is moving forward nicely. Jack A. Goldstone is a fellow at the Woodrow Wilson International Center for Scholars and Hazel professor of public policy at George Mason University. He is the author of Revolutions: A Very Short Introduction. The views expressed in this article are solely those of the author. Heading into the APEC Summit, the U.S. and China may need to narrow their interpretation of the concept.